In 1983, the British Home Championship was entering in its penultimate season. As stated in the previous entry on this topic, there was pressure from the authorities to disband this nearly century old competition due to security concerns. England and Scotland were more receptive to this idea. The first match of the 1983 Home Championship was played on February 23rd, 1983, England hosted Wales at Wembley. This was the first season of Bobby Robson in charge of England. On the day of the match, Manchester United and Arsenal matchup was scheduled for the League Cup. 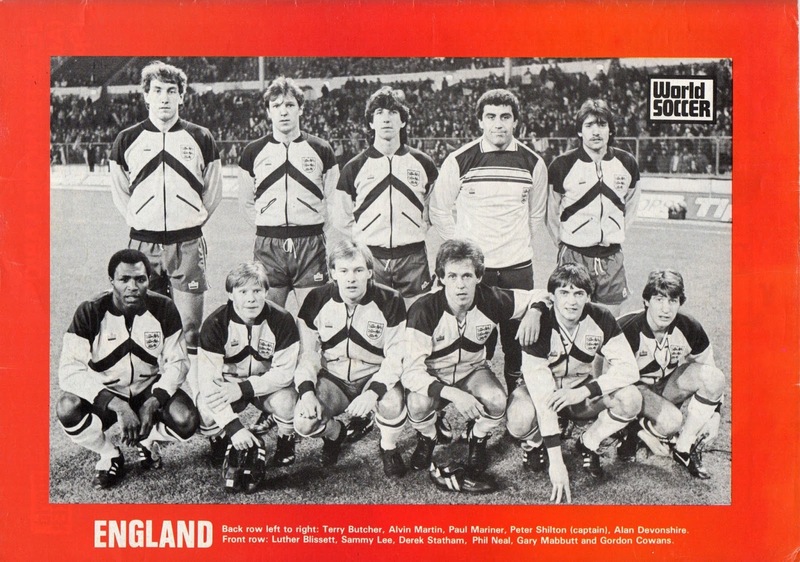 As a result, many eligible England players could not be called up, which included Captain Bryan Robson, as well as Ray Wilkins, Steve Coppell, Kenny Sansom, Tony Woodcock and Graham Rix. The withdrawals allowed Robson to give first caps to Derek Statham and Gordon Cowans. At the time, the attendance of 24,000 was Wembley’s lowest ever attendance, the cold weather may have contributed to that and even the ground was frozen. England had not defeated Wales in 10 years. Wales were near full strength and went ahead in the 14th minute against the run of the play. Kevin Ratcliffe crossed into the box, Robbie James flicked it up , Davies got a touch and Ian Rush pounced on the loose ball. England levelled the score in the 39th minute. Luther Blisset went into the box, and after an entanglement, Alan Devonshirec took possession and crossed for Butcher, who was unmarked on the right side, to score his first ever International goal. 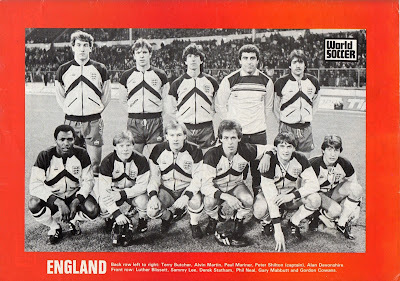 The second half was uneventful and England scored their winner in the 78th minute, through a penalty kick by Phil Neal, after debutant Cowans was fouled in the box by Flynn in the box after a one-two with the other debutant Statham. The next match took place three months later, on May 24, 1983 at Glasgow between Scotland and Northern Ireland. Billy Bingham’s Northern Ireland were in full strength with many of the 1982 World Cup veterans. The only one missing was Norman Whiteside who missed all these matches. Scotland were missing many regulars due to injuries and club commitments, such as Aberdeen’s Jim Leighton, Miller, McLeisch, Liverpool’s Dalglish, Hansen and Souness and Leeds’ Frank Gray. In addition, Aberdeen’s Gordon Strachan only appeared after the break. 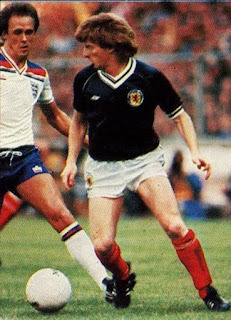 This was an experimental Scottish squad with Neil Simpson earning his first cap and Richard Gough and Charlie Nicholas both earning their second caps. John Wark and David Narey were the only usual regulars that Jock Stein started with. In an uneventful match, the Scottish were more dominant in the second half, but could find no way through the Northern Irish defense, despite a penalty appeal for a foul on Nicholas. England had many of its regulars back and Northern Ireland’s squad was similar to the one vs. Scotland a few days before. Bobby Robson gave first caps to Graham Roberts and John Barnes. Glenn Hoddle earned his first start under Robson. Debutant Graham Roberts almost scored an own goal when he headed a cross by Armstrong towards his own goal, but Shilton saved with a quick reflex. In general, Northern Ireland dominated without really being able to break through England’s defense. In another scoreless draw for Northern Ireland, Sammy McIllroy and O’Neill were their best players, while Peter Shilton stood out for England. In the other match that day, Scotland earned their first victory in Wales in a decade. Scotland were near full strength and made seven changes from their previous match and rested Charlie Nicholas. Wales gave first caps to Slatter and Lowndes. Scotland took the lead in the 11th minute. Gordon Strachan took a corner that McLeisch headed down towards the goal and Andy Gray turned it in right in front of the goal. Scotland’s second was scored in the 67th minute. Souness sent a ball into the box for Gough that Southall was unable to control, Alan Brazil took the loose ball and scored his first ever goal for Scotland. On May 31st, Northern Ireland hosted Wales at Windsor Park. Wales gave first caps to Alan Davies and Jeff Hopkins. 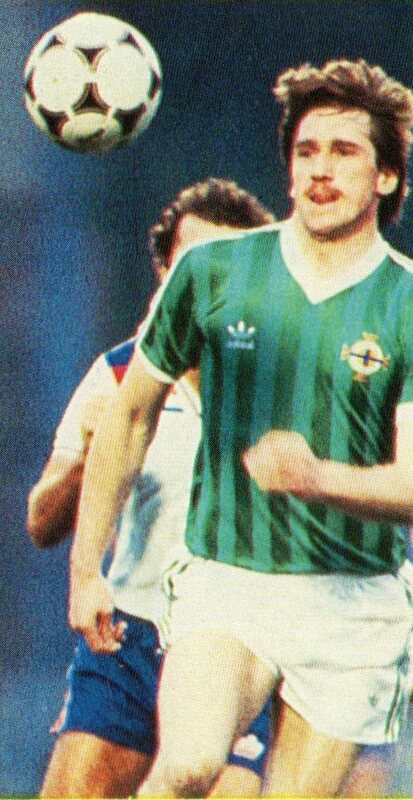 Northern Ireland dominated for long spells and Gerry Armstrong even hit the post in the 5th minute, but just like the previous matches just could not score. 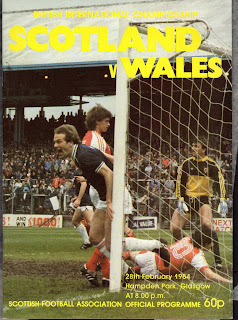 Wales went ahead in the 64th minute when Southall took a punt that Chris Nicholl failed to clear and Gordon Davies ran and chipped the ball over Jennings. This result ended Northern Ireland’s four year unbeaten run at home. The next day (June 1st) at Wembley: England hosted Scotland for their 101st meeting. The match was played in the evening at midweek to reduce any incidents of hooliganism. Both squads were at full strength for this important annual matchup. Scotland dominated the early exchanges, though England eventually took control. England captain Bryan Robson was injured in an early tackle by Narey. Despite the pain he still stayed on. In the 13th minute, Robson gave England the lead while still in pain. Kenny Sansom’s throw in was headed on by Terry Butcher and tapped in by Robson. Robson was replaced in the 25th minute by Mabbut, as he was unable to continue. England scored the second early in the second half, after a Trevor Francis cross from the right, led to a scramble that involved Neal and Cowans. Cowans shot the loose ball and scored his first goal for England. Trevor Francis and Sammy Lee both had goals disallowed for infringements. For Scotland, Charlie Nicholas was subbed off after an indifferent game. Many observers believed that his upcoming transfer from Celtic Glasgow to Arsenal was on his mind and he was unable to concentrate on the match at hand. This was the last ever Home Championship won by England. 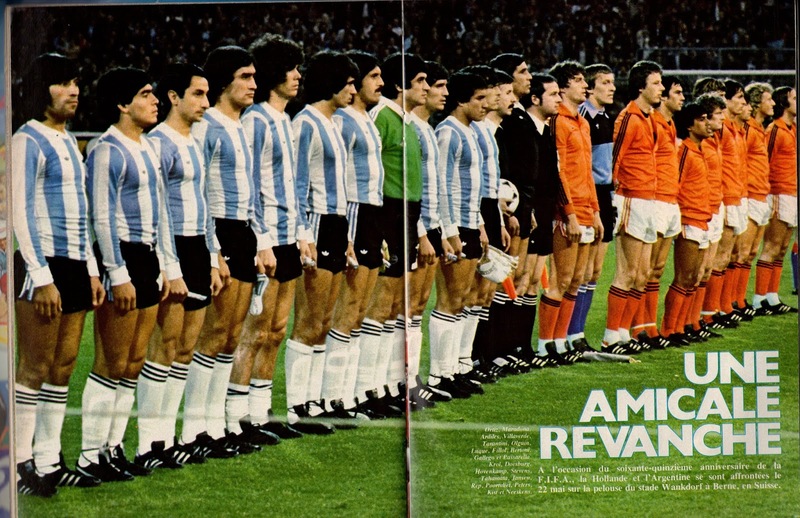 For many months after their 1978 World Cup triumph on home soil, the Argentinean Nation as well as its Football Association were celebrating a then-unprecedented title in a country still beset by Political and Social Problems. Its National Team took a deserved break after years of continuous training camps and friendly matches. However, starting the New Year (1979), the National Team program had to get back to work. In January, Argentina Manager César Luis Menotti had to oversee Argentina’s Under-20 squad’s qualification matches for the U-20 World Cup to be played in August/September. A Tour for the Senior squad had been planned for the summer of 1979. This Tour was to be the first step in Argentina’s preparation for the defense of its World Cup title in 1982 at Spain. As defending Champions, Argentina were to qualify directly, as a result, they had neither qualifiers nor Official matches prior the World Cup. But before any thought could to be given on the upcoming Tour, it was unclear wether Menotti would still be the man in charge (for this Tour and beyond). Following the World Cup triumph, naturally, Menotti had been flooded with a myriad of offers from top European clubs. He was therefore in a strong bargaining position to renegotiate his contract with the Argentine FA. His demands were deemed too extravagant for AFA President Alfredo Cantilo. With the matter still unresolved, Cantilo stepped down from his post in April. A committee was formed under Independiente President Julio Grondona to handle the contractual matter to retain Menotti. He was successful in doing so and reached an agreement with Menotti for a new four-year contract until December 31, 1982. Menotti would receive £60,000 signing-on fee and £5,000 monthly salary (subject to be increased per cost of living changes). In addition he was to receive double the bonus given to the players. In fact Grondona’s success in reaching a deal paved the way for him to be the new Argentina FA President. With the salary dispute out of the way, Menotti could now start planning Argentina’s Tour. Menotti wanted European opposition since with no qualifiers on the horizon, European teams would most likely be their oppoenents at the World Cup. The Tour would consist of matches against Holland (Replay of the last WC Final), Italy, Republic of Ireland and Scotland. 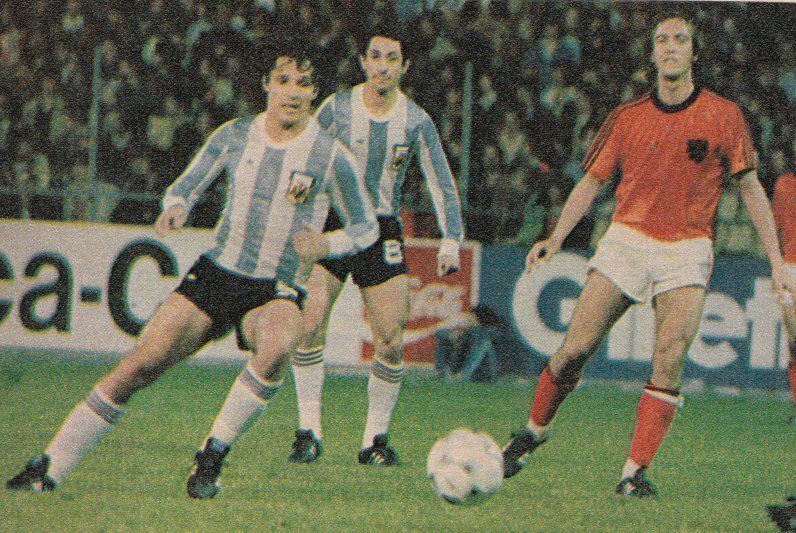 Once this phase of the Tour in Europe was over, the team would make its way back to Argentina with a layover in USA for a lucrative friendly vs. NY Cosmos. Then the Tour would conclude on home soil with a high prestige friendly against a World Selection to commemorate the previous year’s World Cup win. After this Tour, Menotti would have to manage Argentina in the Copa America and also to take charge of the Under-20 squad for their World Cup finals in Japan in August/Septmber. 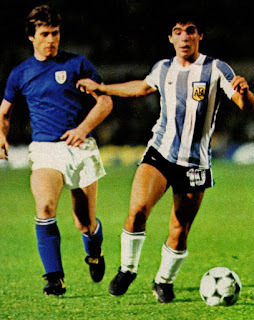 The most important talking point of this Tour was also the fact that Menotti was about to unleash Diego Maradona, the 18 year old wonder of Argentinos Juniors, onto the World stage. He had selected Maradona, as a 16 year old, for a number of matches in 1977, but had not included him for the 1978 World Cup Finals squad as he believed he was still too young to handle such pressure and wanted tried and tested men. This Tour was the ideal opportunity to include the player who was already being touted as the ‘new Pele’. Once this Tour was over, Maradona was also to participate in the Under-20 World Cup (which Argentina would win with significant contribution by Maradona that only enhanced his legend). 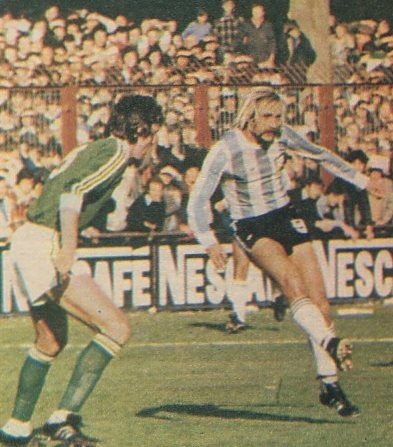 A month prior to emabarking on the European Tour, Argentina played a friendly at Buenos Aires vs. Bulgaria (April 25, 1979, 2-1 Argentina win). Menotti took the opportunity to give first caps to many newcomers who would be participating on the Tour, such as Hugo Villaverde, Juan Barbas, Hugo Perotti, Jose Reinaldi and Jorge Garcia. Menotti selected an initial squad of 23 players to participate on the Tour. He had stated that some players would not be selected because of their age by the next World Cup. He also declared that he would not include the players with foreign clubs. Since the World Cup, some players had left Argentina to earn their living abroad. Therefore, he did not call up Mario Kempes (Valencia) , Daniel Bertoni (Sevilla), Alberto Tarantini (Birmingham), Osvaldo Ardiles (Tottenham), Ricardo Villa (Tottenham) and Ricardo La Volpe (with Atlante in Mexico). Star striker Mario Kempes had already been in Spain with Valencia for a number of seasons, the rest had joined after the Tournament. Of those mentioned Alberto Tarantini received a reprieve and was added to the squad after he had returned to Argentina. Others to be left out were players such as Luis Galvan, Ruben Paganini, Daniel Killer and Ricardo Bochini. Norberto Alonso had been left out as well after criticizing Menotti’s handling of the team. The selected squad included many 1978 World Cup winners. These included Captain Daniel Passarella, goalkeepers: Ubaldo Fillol and Hector Baley, Defender: Jorge Olguin and Alberto Tarantini, Midfielders: Americo Gallego, Miguel Oviedo and José Valencia and strikers: René Houseman, Leopoldo Luque and Oscar Ortiz. Argentina started its Tour on May 22nd at Berne’s Wankdorf Stadion in Switzerland vs. Holland. The 1978 World Cup Final replay was a special friendly to commemorate the 75th Anniversary of FIFA. 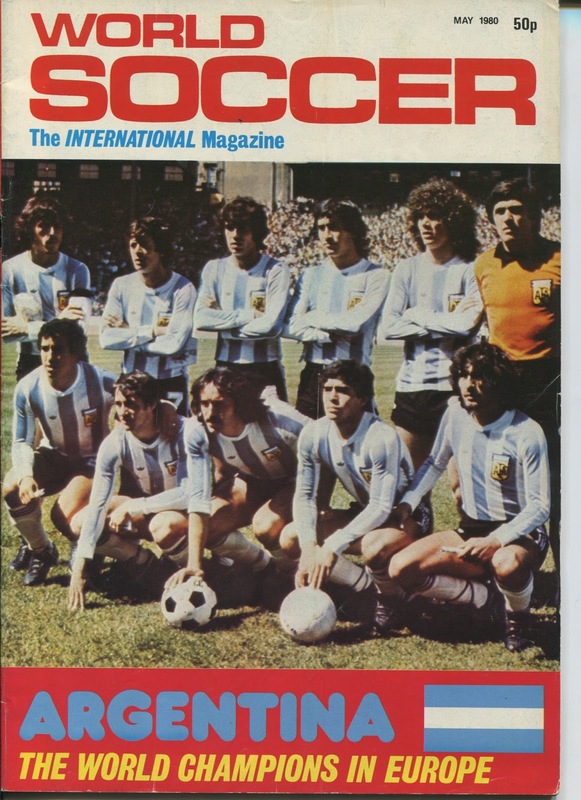 Menotti had said that he would select the squad to resemble as closely as possible to the 1978 World Cup winning squad. Therefore, he relented and included foreign based duo of Osvaldo Ardiles and Daniel Bertoni in the squad. In fact the starting lineup included nine players who started in the previous year’s final. The only new additions were Maradona and defender Hugo Villaverde. 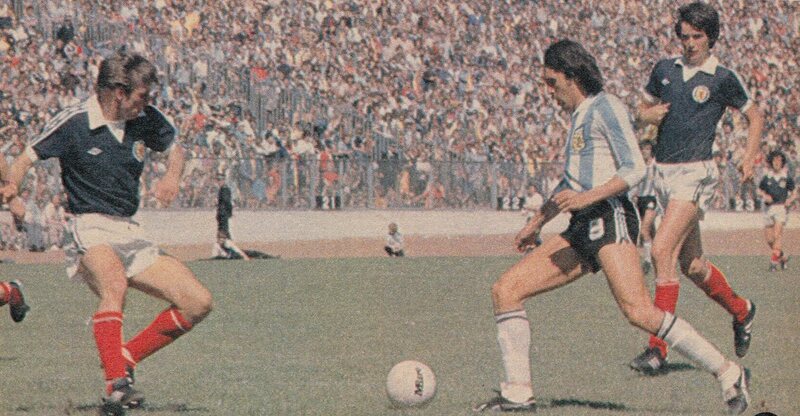 Villaverde had supplanted Luis Galvan who was deemed out of form at the time, while Maradona was in place of Kempes. Interestingly, Kempes’ absence was declared because of ‘injury’, that may have been a diplomatic injury. For their part, the Dutch started with five players from the previous year’ final. The side was still captained by Ruud Krol (earning his record 65th cap) and included Wim Jansen, Johann Neeskens and Johnny Rep. For once, neither of the van der Kerkhof twins started, though René would come on in the second half. Robby Rensenbrink had voluntarily declared himself unavailable for selection, which allowed Simon Tahamata to earn his first cap. 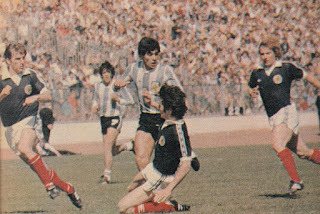 This match marked Diego Maradona’s debut on the World stage. Despite being scoreless, the match had a lot of action, especially in the first 20 minutes and both sides had chances to score. The teams played more cautiously in the second half and there were fewer chances. In the second half, Menotti replaced his three strikers (Bertoni, Luque, Ortiz) with two defensive players (Barbas, Trossero) to give an indication of his defensive intentions. 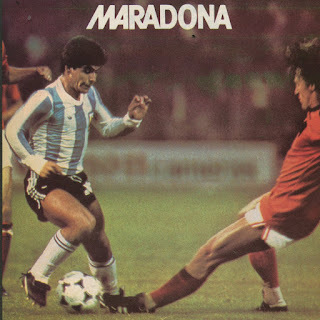 At this point, Maradona was alone and too isolated to conjure up anything. He had a strong appeal for a penalty kick that was not given. The match was decided on a penalty kick shoot-out that the Argentines won 8-7 to receive the FIFA Jubilee Crystal trophy. A few days later (May 26th), Italy hosted Argentina at Rome’s Olympic Stadium. The day before Pope John Paul II received both squads. Italy, the only squad that had defeated Argentina during the World Cup, was virtually the same squad as the previous year. The only changes were the inclusion of defender Fulvio Collovati and midfielder Gabriele Oriali replacing Mauro Belluggi and Romeo Benetti. Argentina made three changes from the Holland match. Ardiles and Bertoni returned to their foreign clubs. In their place came Juan Barbas and René Houseman. Oscar Ortiz had also played his last for Argentina in the Holland match. In his place and for the rest of the Tour, José Valencia started. This would be the preferred formation of Menotti for the rest of the Tour. Argentina scored first in the sixth minute. Passarella won the ball in middle of the field and sent Valencia clear, who despite pressure from Scirea, took a shot that hit Zoff but trickled into the net despite Collovati’s desperate attempt to clear. Italy tied the match in the 25th minute. A throw- in on the left side from Cabrini was sent towards Causio who flicked it over Villaverde and volleyed it from the edge of box and looped it over Fillol. Italy went ahead in the second half (55th minute). 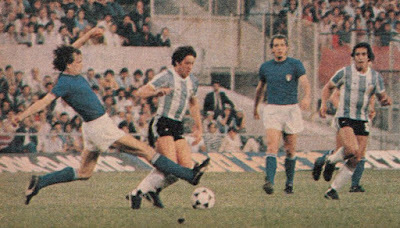 Antognoni won a ball in midfield from Passarella and immediately sent Rossi clear on the left side, Rossi stopped and turned around, which unbalanced Villaverde who fell, and shot over Fillol into the top right corner. Argentina tied the match just a minute later, when a penalty kick was awarded after Scirea pushed Maradona in the box. Passarella scored from the spot. Next, Argentina traveled to Britain to play two more friendlies. Their first match (May 29th) at Dublin was against the Republic of Ireland. This friendly was a UNICEF benefit charity match that the Irish did not even consider a Full International. The match also served as Johnny Giles’s Farewell as a player for Ireland (though not as Manager). After the prestigious encounters vs. Holland and Italy, Menotti did not consider this match as important. A fact that was reflected in his selections. Passarella, Gallego, Luque and Maradona were rested and did not start. Enzo Trossero, Miguel Oviedo, Jose Reinaldi and Hugo Perotti started in their place. Ireland seemed to better in the first half, in a game that apparently neither side seemed to take seriously, only livened up in the second half when Diego Maradona entered the field. Barbas and Reinaldi hit the post, but the match remained scoreless. Maradona had delighted the crowd and the next day, most newspapers were proclaiming Maradona as the next great one. The final match of the European phase of the Tour was vs. Scotland at Glasgow’s Hampden Park (June 2nd). Menotti started this match with the same lineup as vs. Italy. For the first ten minutes, Scotland applied pressure, but that was the extent of their dominance. Argentina were dealt a blow when Villaverde was injured in the 21st minute. He was replaced with Trossero, with Passarella moving to the right back slot. Maradona took control of the match and gave a further indication of his future dominance to the European crowd. In the 33rd minute, Maradona from the middle of field moved past a number of Scottish defenders and passed to Luque for the first goal. In the second half, Argentina continued to dominate and increased its advantage. In the 61st minute, Luque was sent clear from a pass in the middle and had to go around Rough to slot home his and Argentina’s second. In the 70th minute, Diego Maradona scored his first ever goal for Argentina. He received a ball on the left side edge of the box and lobbed it over Rough. Scotland salvaged some pride with five minutes left, through a consolation goal from Arthur Graham. At the end of the match, the crowd applauded Argentina’s positive display with chants of ‘Argentina, Argentina’. Menotti satisfied with the Tour and believed the team was just as motivated as during the World Cup. 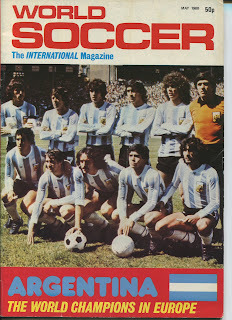 He noted improvements in the counter attacking game that Menotti believed the Argentineans lagged behind the Europeans. 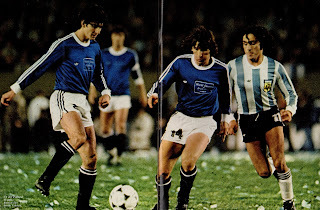 1978 Veterans such as Passarella, Tarantini, Gallego and Luque had given good accounts of themselves. 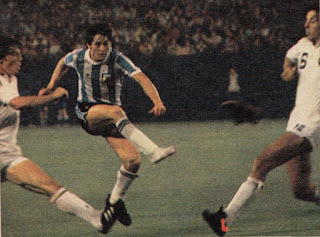 On their way back, from the old continent, Argentina played a friendly in New Jersey vs. NASL’s New York Cosmos, four days after the Scotland match (June 6th). Clearly, the match had been arranged for financial reasons since it held no instructional value. The Argentine media considered this match as a show and not serious preparation. The match was played on Artificial Turf against a club side that was not worthy of its previous opponents from the Tour. Argentina started with the same lineup as the Italy and Scotland matches, with the only change being Miguel Oviedo starting in the place of the injured Villaverde. 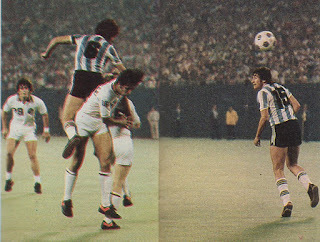 The scrappy match was won with two minutes, when Daniel Passarella jumped higher than everyone to head home a free kick taken from the left by José Valencia. Afterwards, Menotti declared that never again would he authorize the National Team to play in this type of a match. He stated that he clearly understood financial priorities that would require such matches, but certainly not in those types of conditions (Field, opponent, etc.). After being back on home soil, Argentina had less than three weeks to prepare for what was to be the most hyped match of this Tour. The match, organized by the Newspaper ‘Clarin’, was to feature Argentina vs. a World Selection to be played (June 25th), exactly on the first year Anniversary of the previous year’s World Cup Final. 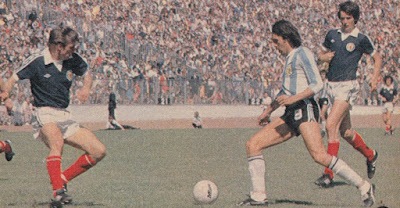 Menotti recalled Luis Galvan for this match as Villaverde was still injured. Osvaldo Ardiles was also selected and arrived from Tottenham and started in place of Barbas. The World Selection was to be managed by Italy’s Enzo Bearzot with each player receiving $5,000 appearance fee. In general these types of matches are light in nature and are outright dismissed by critics as circus matches with many substitutions. However, Bearzot took this match seriously and managed to mould a team, despite having only two full sessions with the players and having lost Roberto Bettega and Andras Torocsik to injuries just days before the match. Bearzot prepared the squad with such importance that he went as far as to entrust the battling Marco Tardelli with the task of shadowing Maradona. His handling of Maradona for this ‘friendly’ was even more brutal than Claudio Gentile’s handling of Maradona during the 1982 World Cup. The World Selection played very tight defensively with Paolo Rossi as the lone striker for long spells during the match. Argentina’s winger René Houseman had a disappointing game, as a result Argentina were unable to exploit the flanks. 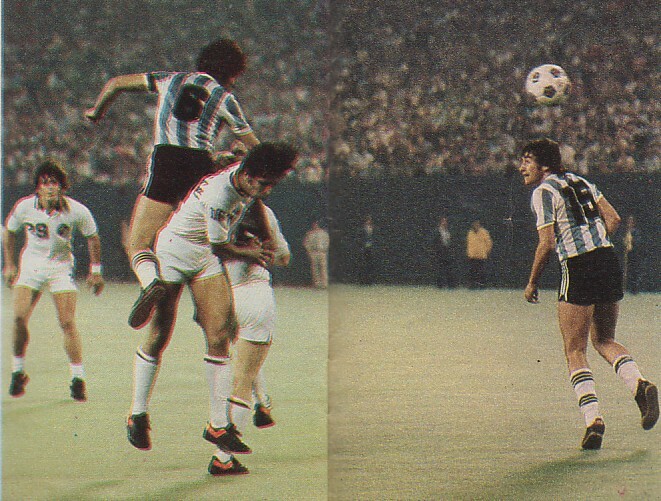 Jorge Olguin in defense also had a poor match and was unable to control Zbigniew Boniek, who many considered as the best player ofon the field. Argentina starting playing better near end of the first half, but the World defense was excellent. 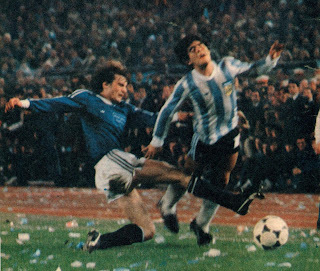 Despite virtually marking Maradona out of the game, Tardelli was powerless to stop him in a moment of brilliance. In the 28th minute, Passarella from the center passed to Valencia who sent a cross on the right side for Maradona, who curled the ball past Emerson Leão in the top left corner. The World Team looked more dangerous and improved in the second half once Zico came on the field replacing Platini. Argentina had a penalty appeal after a foul on Houseman that was denied, but otherwise it was the World Team that took control. In the 68th minute, Causio sent Zico clear on the right side, who then crossed the ball across intended for Rossi. Luis Galvan, under pressure from Rossi, scored into his own net. 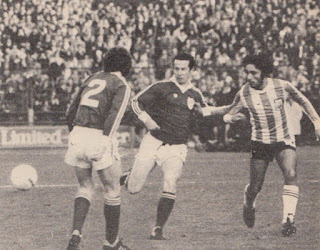 Five minutes later, Zico won a ball near the edge of Argentina box and laid it for Causio, who crossed it across on the right side for Toninho, who crossed it across and Zico struck into the empty net. Minutes later, Marco Tardelli was sent off after yet another brutal foul on Maradona. In contrast to previous year, it was Ruud Krol who collected the winner’s trophy as Captain. The Argentine Match Organizers were clearly disappointed as they were hoping and expecting a victory to commemorate and celebrate. Menotti for his part downplayed the result and said it was no shame to lose to such a team with such great players. After the match Menotti said festivities were over and now serious preparation would start. At the end of the Tour, players such as Houseman, Ortiz, Outes, Oviedo and Perotti were no longer selected. For the Copa America in July and August, he selected essentially a B squad led by Passarella as guide and including Maradona, Barbas and Valencia. Later in late August and September, he guided the Under-20 Squad to World Cup victory with Maradona as the main star. As many as thirteen players who took part on the Tour made the 1982 World Cup squad. 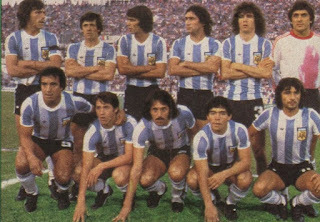 These included: Ardiles, Baley, Barbas, Bertoni, Fillol, Galvan, Gallego, Maradona, Olguin, Passarella, Tarantini, Trossero and Valencia. Menotti had been more than satisfied with the Tour. He was laying the groundwork for the title defense and seemed to be on the right track. But historically, this Tour will always be remembered as Diego Maradona’s proper introduction to the World. Despite his youth, he had proven that he was the Real Deal and the next undisputed King of the Game.